Background: Candida albicans is an opportunistic yeast that causes more than 90% of all vulvovaginal infections. Because of being inherently resistant to antifungals drugs such as azole derivatives, the search for anti-Candida albicans agents with new pharmacological targets is considered as the main therapeutic strategy to prevent and treat these types of infections. In this context, products of natural origin are a promising source of compounds with antifungal activity. Objective: The current review analyzes clinical evidence on the effectiveness of natural products in the vulvovaginal Candida albicans infections. Method: A literature review in the electronic databases PubMed, Google Scholar, Cochrane Library Plus, Web of Science, Latin American and Caribbean Literature on Health Sciences (Lilacs) and Scientific Electronic Library Online (SciELO) using the search terms “Natural Products”, “Phytotherapy”, “Vulvovaginal Candidiasis” and “Clinical Trials” together with the Boolean term ‘AND’ was performed. English, Spanish and French articles without restriction of date of publication were considered. Results: A total of 13 clinical trials (most of them randomized clinical trials which used azoles as control group) evaluated the anti-Candida activity of a total of 11 different natural products (i.e. Zataria multiflora essential oils, Ageratina pichinchensis and Solanum nigrescens extracts and saponins from Solanum chrysotrichum, among others) against vulvovaginitis have been included in the current review. 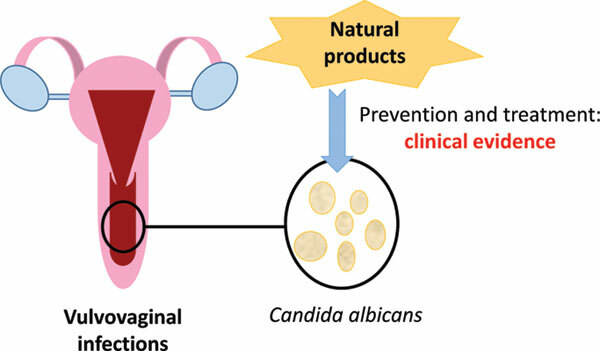 Conclusion: Because of the few clinical trials it is difficult to establish a consistent conclusion about the effectiveness of natural products in the prevention and treatment of vulvovaginitis caused by Candida albicans. Future studies should be aimed at evaluating new natural products as well as conducting more clinical research with promising natural substances already investigated in clinical trials. Keywords: Candida albicans, Vulvovaginal candidiasis, Natural products, Clinical evidence, Drugs, Clinical trials. Keywords:Candida albicans, Vulvovaginal candidiasis, Natural products, Clinical evidence, Drugs, Clinical trials. Abstract:Background: Candida albicans is an opportunistic yeast that causes more than 90% of all vulvovaginal infections. Because of being inherently resistant to antifungals drugs such as azole derivatives, the search for anti-Candida albicans agents with new pharmacological targets is considered as the main therapeutic strategy to prevent and treat these types of infections. In this context, products of natural origin are a promising source of compounds with antifungal activity.